Also, check out my and posters and presentations. Presenting my research on deep learning and EEG signals at the 2016 International BCI Meeting. Learning Deep Representations of EEG Signals in Mental-Task Brain-Computer Interfaces using Convolutional and Recurrent Networks. Elliott M. Forney (2017) Preliminary PhD Exam. Department of Computer Science, Colorado State University, Fort Collins, CO.
Detecting P300 ERPs with Convolutional Networks. Elliott M. Forney, Charles W. Anderson, Patricia L. Davies, William J. Gavin, Marla C. Roll. 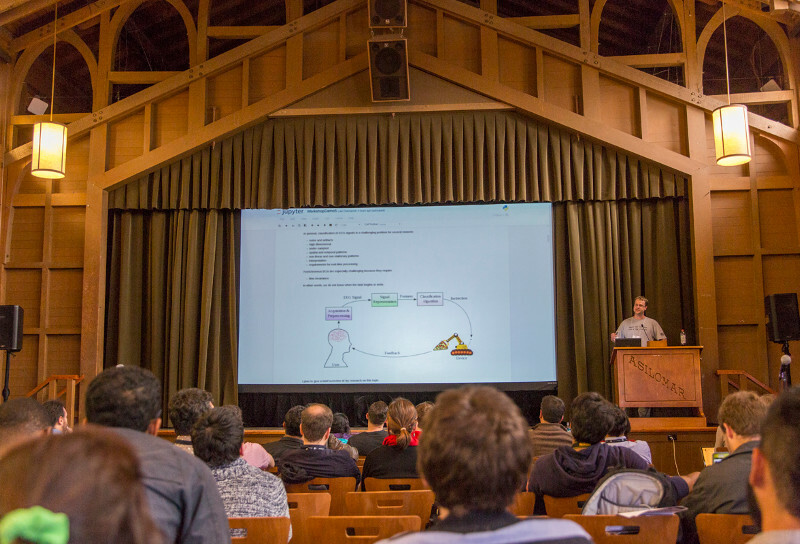 Proceedings of the International Brain-Computer Interface Meeting, Asilomar California, May 30th – June 3rd, 2016. Graz University of Technology Publishing House. CEBL3: A New Software Platform for EEG Analysis and Rapid Prototyping of BCI Technologies. Elliott M. Forney, Charles W. Anderson, William J. Gavin, Patricia L. Davies, Marla C. Roll, Igor Ryzhkov, Fereydoon Vafaei. Proceedings of the International Brain-Computer Interface Meeting, Asilomar California, May 30th – June 3rd, 2016. Graz University of Technology Publishing House. Echo State Networks for Modeling and Classification of EEG Signals in Mental-Task Brain Computer Interfaces. 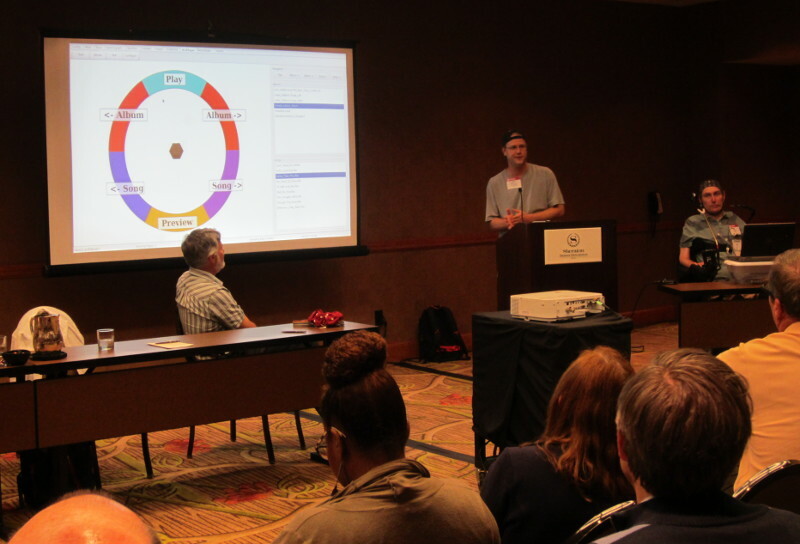 Elliott M. Forney, Charles W. Anderson, William J. Gavin, Patricia L. Davies, Marla C. Roll, Brittany K. Taylor, (2015) Technical Report, Department of Computer Science, Colorado State University, Fort Collins, CO.
Presenting our research on Brain-Computer Interfaces and demonstrating our CEBL software during a workshop at the Rehabilitation Engineering and Assistive Technology Society of North America (RESNA) Annual Conference, June 13th, 2015, Denver, Colorado. Brain Computer Interface Classifier Parameters Are Influenced by Practice: Results from a P300 Speller. Kimberly The, Brittany Taylor, Jewel Crasta, Mei-Heng Lin, Elliott Forney, Charles Anderson, Patricia Davies and William Gavin. Proceedings of the Society of Psychophisological Research (SPR), 2014. Representing and Classifying EEG Signals in Mental Task Brain-Computer Interfaces. Elliott M. Forney (2013) Research Exam. 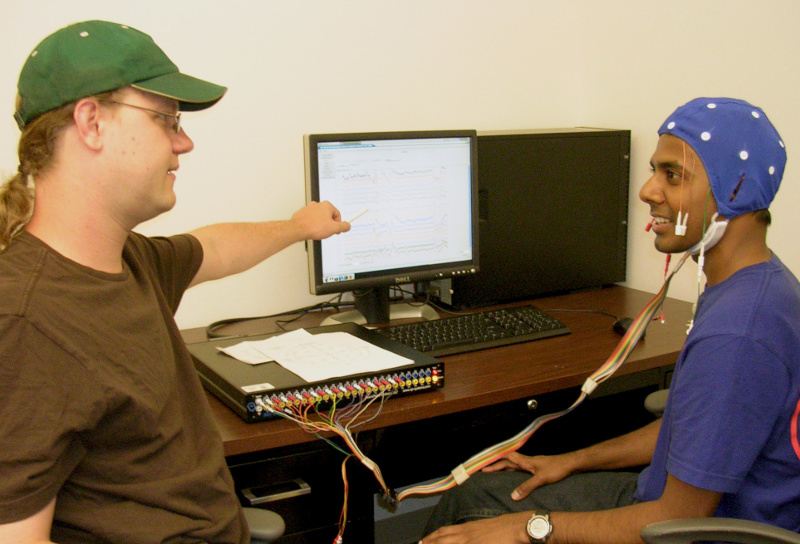 Department of Computer Science, Colorado State University, Fort Collins, CO.
Elliott and Malai working in the EEG lab. EEG character identification using stimulus sequences designed to maximize mimimal hamming distance. Tadanori Fukami, Takamasa Shimada, Elliott Forney, Charles W Anderson. Annual International Conference of the IEEE Engineering in Medicine and Biology Society, August 28 – September 1, 2012. pp. 1782 – 1785. 2012. Overcoming Barriers in Noninvasive Brain-Computer Interfaces. Elliott Forney, Kathleen Ericson, Charles Anderson, Shrideep Pallickara, William Gavin, Patricia Davies, Marla Roll, Zachary Cashero. Summary of our research in Brain-Computer Interfaces for the g.Tec Brain-Computer Interfaces Competition. July 2012. Electroencephalogram Classification by Forecasting with Recurrent Neural Networks. Elliott Forney (2011) Masters Thesis. Department of Computer Science, Colorado State University, Fort Collins, CO. Classification of EEG During Imagined Mental Tasks by Forecasting with Elman Recurrent Neural Networks. Elliott Forney and Charles Anderson. Proceedings of the International Joint Conference on Neural Networks, July 31–August 5, 2011. pp. 2749–2755, 2011, DOI: 10.1109/IJCNN.2011.6033579. Reliable identification of mental tasks using time-embedded EEG and sequential evidence accumulation. Charles Anderson, Elliott Forney, Douglas Hains and Annamalai Natarajan. Journal of Neural Engineering, April 2011, vol. 8, no. 2, 025023. Critical issues in state-of-the-art brain-computer interface signal processing. Krusienski, D., Grosse-Wentrup, M., Galan, F., Coyle, D., Miller, K., Forney, E., Anderson, C. Journal of Neural Engineering, April 2011, vol. 8, no. 2, 025002.